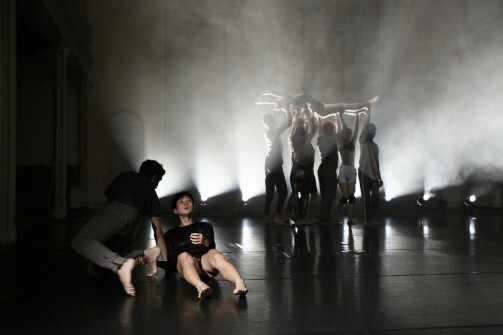 Christine Bonansea's OnlyHuman at Danspace Project. Photo by Gaia Squarci. BOTTOM LINE: An arresting, existential look at human identity. Mankind’s dual nature has long posed a philosophical quagmire, spawning countless theories on our capacity for good or evil. With the advancement of technology, and its potential to both advance and strip away our humanity, these questions acquire greater importance, and Christine Bonansea’s OnlyHuman makes this urgency palpable. Inspired by Human, All Too Human, Friedrich Nietzsche’s analysis of individual psychology and social structures, OnlyHuman uses jarring solo and ensemble movement, video design, and experimental music to highlight the paradoxes of our existence. Beginning in near-darkness, OnlyHuman’s disjointed video projections set the tone as a woman onscreen describes her loss of direction and the cycle of confusion, search, and waiting it produced. As the lights rise onstage, sweatsuit-clad soloist Mei Yamanaka appears and slowly starts moving, twisting her limbs like a robot becoming animate. Yamanaka’s motions grow sharper and more frantic as the piece continues, the exploration of her body’s capability turning to surrender at its sheer force. Careening through fog-machine haze, and accented by Nicole Carroll’s droning soundscapes, Robert Flynt and Yoann Trellu’s pixelated projections, and Solomon Weisbard’s searing lighting, Yamanaka resembles an overworked machine, driven to combustion but unable to stop herself. Ensuing segments nod to our animalistic origins and evolutionary process: Yamanaka writhes on the floor as she struggles against gravity, peeks out from her cocoon-like sweatshirt, and scrambles through blood-red landscapes as if hunted. With impressive physical command, Yamanaka’s universal being takes us through each facet of the exploration, fear, and challenge of self-discovery. Just as Nietzsche’s text moves from self-conception to analysis of group dynamics, a nine-dancer ensemble (Alvaro Estado, Maya Orchin, Becca Loevy, Amelia Heintzelman, Ichi Go, Cameron Mckinney, Charles Gowin, Kristopher K.Q. Pourzal, and Malcolm Betts) joins Yamanaka onstage in the second half to plumb the nuances of human socialization. Emerging from the audience as a weary Yamanaka collapses against a pole, it’s unclear whether the figures we see gather to help, gawk, or finish her off. The group’s synchronized movements range from chillingly mechanical to gracefully birdlike, revealing society’s power to support our most beautiful or merciless inclinations. Likewise, scenes of discord can be as striking as they are disturbing, the shared chaos reminiscent of heated battles or lively dance floors. The conflict of personal will and societal influence runs throughout: the ensemble hoists soloists like gods or sacrifices, individuals climb and fall from heaps of bodies, and single dancers emerge from or dissolve into the collective current. Like its source material, OnlyHuman functions largely as critique, its fast pace and unsettling imagery depicting the fevered human climb to progress and the all-too-easy slide into selfish animality or robotic conformity. However, as Yamanaka and the ensemble show, this struggle can also be beautiful, producing stimulating tension and uncanny feats of strength and skill. Conversely, the piece’s rare moments of stillness show how surrender to our limits can be as merciful as it is frustrating, and as much an impetus for growth as periods of action. As the opening video suggests, there’s an odd peace to be found in accepting our humanity: when personal will exhausts or outside options fail, embracing the void can free us to start anew. OnlyHuman is conceived and choreographed by Christine Bonansea. Presented by Christine Bonansea Dance Company. Original Music Composition and Performance by Nicole Carroll. Lighting Design by Solomon Weisbard. Photography by Robert Flynt. Graphic Programming and Video by Yoann Trellu. The cast is Mei Yamanaka, Alvaro Estado, Maya Orchin, Becca Loevy, Amelia Heintzelman, Ichi Go, Cameron Mckinney, Charles Gowin, Kristopher K.Q. Pourzal, and Malcolm Betts.